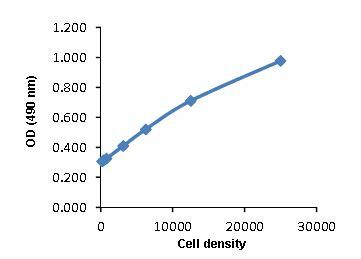 MTS Assay Kit ab197010 uses a colorimetric method for the sensitive quantification of viable cells. It can be used to assess cell proliferation, cell viability and cytotoxicity. The MTS assay protocol is based on the reduction of the MTS tetrazolium compound by viable mammalian cells (and cells from other species) to generate a colored formazan dye that is soluble in cell culture media. This conversion is thought to be carried out by NAD(P)H-dependent dehydrogenase enzymes in metabolically active cells. The formazan dye is quantified by measuring the absorbance at 490-500 nm. The MTS assay protocol is performed by adding the MTS reagent directly into the cell culture media, without the intermittent steps which are required in the routine MTT assay. In addition, this high-throughput assay requires no washing or solubilization step and can be performed in a 96-well microtiter plate. MTS assays are often used for the measurement of cell proliferation in response to growth factors, cytokines, mitogens, and nutrients, etc. They are also used for the analysis of cytotoxic compounds like anticancer drugs and other toxic agents. Review our cell health assay guide to learn about kits to perform a cell viability assay, cytotoxicity assay or cell proliferation assay. Cell proliferation is the multiplication or reproduction of cells, as a result of cell growth and cell division, resulting in the expansion of a cell population. Jurkat cells were cultured at different densities overnight at 37°C in a final volume of 200 µL/well. MTS reagent was added and absorbance at OD=490 nm was recorded using ELISA plate reader. Each point represents a mean of 3 replicates. Assay was performed according to the kit protocol. Publishing research using ab197010? Please let us know so that we can cite the reference in this datasheet. There are currently no Customer reviews or Questions for ab197010.